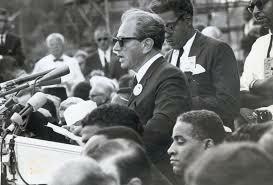 Speaking before Dr. Martin Luther King, Jr.’s famous “I Have a Dream” speech at the March on Washington in 1963, Rabbi Joachim Prinz declares “America must not become a nation of onlookers. America must not remain silent.” Rarely have these words rung truer than in present-day America. Join us for a screening of the 2014 documentary film Joachim Prinz: I Shall not Be Silent and learn the story of the young rabbi in Berlin who stands up to the Nazi regime and is expelled to the United States only to find that the oppression he knew in Germany is replicated for African Americans here. After the film, Rachel Eskin Fisher, a co-producer of the film will lead a discussion and Q&A.